Over 30% of commercial polymers are blends or alloys or one kind or another. 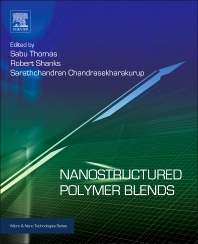 Nanostructured blends offer the scientist or plastics engineer a new range of possibilities with characteristics including thermodynamic stablility; the potential to improve material transparency, creep and solvent resistance; the potential to simultaneously increase tensile strength and ductility; superior rheological properties; and relatively low cost. Nanostructured Polymer Blends opens up immense structural possibilities via chemical and mechanical modifications that generate novel properties and functions and high-performance characteristics at a low cost. The emerging applications of these new materials cover a wide range of industry sectors, encompassing the coatings and adhesives industry, electronics, energy (photovoltaics), aerospace and medical devices (where polymer blends provide innovations in biocompatible materials). This book explains the science of nanostructure formation and the nature of interphase formations, demystifies the design of nanostructured blends to achieve specific properties, and introduces the applications for this important new class of nanomaterial. All the key topics related to recent advances in blends are covered: IPNs, phase morphologies, composites and nanocomposites, nanostructure formation, the chemistry and structure of additives, etc. Explains the performance benefits in areas including rheological properties, thermodynamic stablility, material transparency, solvent resistance, etc. Scientists and Engineers involved in polymer materials design, Design Engineers/Plastics Engineers using Nanostructured Polymer Blends in key sectors: electronics, energy (esp.photovoltaics), aerospace/automotive, medical devices (biocompatible polymers). Dr. Sarath Chandran is currently involved with the various projects of Inter University Centre for Organic Farming (IUCOFSA) which involve (a) Synthesis of biogas, biofuel and bio fertilizer using water hyacinth- funded by the Department of Science and Technology (DST), India, a study on the Use of Molecularly Imprinted Polymers for the detection, estimation and removal of pesticides from farmland- Project funded by Kerala State Council for Science and Technology (KSCST) and a study on Converting abandoned wetland as productive land: a “live laboratory” model for sustainable agriculture- project funded by the Government of Kerala.